« Are Poaching Prevention Strageties Working? Earlier this month a wildlife camera recorded images of the first confirmed American river otter sighting in Boulder in a century. The otter was filmed along the Boulder Creek, east of the city center. 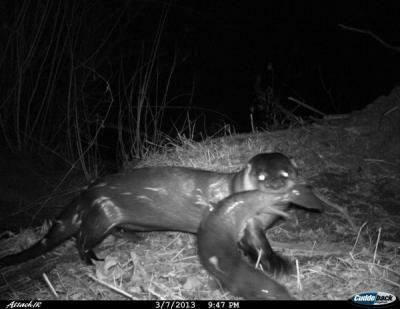 According to Christian Nunes, a wildlife ecology technician for Boulder Open Space and Mountain Parks, the otter was caught on camera twice: once on February 26th, and again on March 7th. Shortly after the photos were released, the Cheyenne Mountain Zoo released a statement that the critter caught on film was not Kitchi, an American river otter that escaped from the zoo three years ago. Kitchi would have had to travel from Colorado Springs to Boulder, a route that is more or less geographically impossible due to otters’ need to remain along riverbanks for food. The river otter has recently been de-listed from endangered to threatened along its range in Colorado. Urban expansion and pollution caused otter numbers to decline in the early to mid 1900s. Restoration efforts that began in the late 1970s have helped reestablish otter populations in many of the state’s riparian ecosystems.